Computers. Computers, especially laptops (because of their portability) have been at the top of this list for some time now. Computers have dual appeal to thieves: for one, there is the tangible, measurable value of the hardware itself. In addition to that, there is the value of whatever information is being stored there. This may include sensitive data about clients for example. People who are most susceptible to having their computers stolen are people in any sort of authority, because there is power to be gained by seizing their stores of information. For example, it is not uncommon for professors to be the targets of this crime. Knowing this should help you consider where you use your computer, and how you protect the information on it. Money. Money is one of the most portable, and immediately usable assets that a person could target, so it is not a good idea to keep large sums of it in your home—especially for any extended period of time. Sometimes, however, against your best planning, you may find that you are temporarily stuck with large sums of cash in your home before you can get to a bank. It's wise to expect that despite your best efforts to avoid this, you will find yourself in this situation, and to prepare accordingly. A safe is one of your best bets in protecting your money from theft. You especially want to ensure that the safe you use is not portable, but is anchored to a part of your home in such a way that it cannot be removed and subsequently broken into. Identification. This may be among the most devastating categories of items a person may have stolen. Among the pieces of identification you may have stolen are: passports, birth certificates, drivers licenses, health cards, social security cards, and credit and bank cards. Theft of any or all of these pieces of identification could have catastrophic consequences for you. Thieves that target these pieces do this for the purpose of committing a crime in your name, as well as draining your assets. In addition to speaking to your insurance provider about identity theft protection, know the whereabouts of these pieces at all times, and don't assume they are safe simply because they are in the confines of your home. Within your home, it is important to have a safe place to keep them. Here again a safe may be an appropriate solution. Change your plans. If the trip you're about to make can be canceled or postponed, this really is your best course of action. Understand the extend of the conditions. Unlike icy patches that form on roads and highways as a result of melt that refreezes, or even unlike black ice, freezing rain is not confined to patches of slipperiness: it will cover the entire expanse of the region that is affected. If you must drive in these conditions, it's important for you to know that you're not going to get relief from the ice; your brakes will have little control in this situation. Get stranded. Most people, if they are not in their homes when inclement weather strikes, usually figure that it's time to rush back before things get really bad. This is actually not advisable with freezing rain. Once it starts, it's bad. You are better off waiting (if you can) where you are until your county or municipality has had a chance to salt the roads. Get clean. Unlike the light frost that you may be used to scraping from your car in the mornings, the ice that you'll find on your vehicle will be thick, and will require a lot of effort to remove. On top of that, if the freezing rain is still coming down, anything you clear off will get replaced almost instantly with a fresh fall. 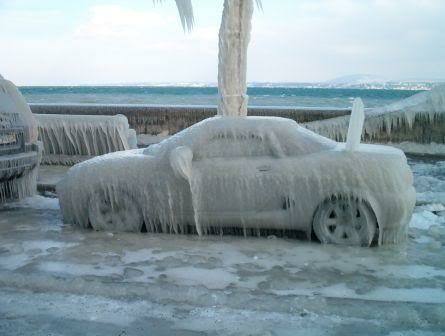 To combat this, get your car warm before you start cleaning—especially the windshield and the back window. No brakes. When you are driving, rely on your brakes as little as possible, since it is unlikely that they will work. Driving safely will now be a matter of being meticulous about the speed you are driving at. While, thankfully, not everyone will necessarily have an experience with identity theft in their lifetime, everyone is certainly susceptible to the possibility. Particularly at risk of this calamity are travelers: it's easier to lose your valuable pieces of identification when you are traveling because (a) you are likely to have them on your person, rather than locked away safely in your home (like a passport, for example) and (b) those perpetrating the crime usually seek victims in locations where travelers are likely to be, such as airports or tourist attractions. This makes you a target. Even without travel, though, the risk of identity theft still exists for someone simply going about their day to day affairs. Identity theft is particularly unfortunate because it could potentially give you a criminal record: the information that is stolen is usually used to commit some type of fraudulent activity, or other crime, using your name. The consequences of falling victim to identity theft can be absolutely devastating. It can damage your credit rating, for one. It also opens you up to the possibility of having your medical records tampered with, leading them to be inaccurate. It can completely mess up your financial history. And most obviously, it can leave you with barely a penny to your name. Don't carry identification or credit cards that you won't be using. For example, there is no need to carry your social insurance card with you on a trip to the mall. Check your credit card statements for fraudulent activity. Check your credit history, and if there are penalties for actions that you know you had no part in, be sure to discover their source. Limit what information you make available about yourself on the internet. Don't simply throw or recycle old documents with sensitive information in them; be sure to shred them first. Stay hydrated. It is so easy to overlook the importance of this advice because of how often we hear it, and because of how many ailments it is prescribed for. However, this really is of utmost importance. Long road trips already have the ability to lull you into a bit of a daze if you happen to come under the spell of road hypnosis, so you don't need to compound that with the drowsiness that ensues as a result of dehydration. The best way to stay alert is to stay hydrated. Be sure to have plenty of water in your vehicle (both in the cabin and in the trunk) to meet this need. Some avoid proper hydration because of the worry of the discomfort they may feel when they have to void, so plan your stops ahead of time. Figure out where the bathrooms are along your route so that this doesn't interfere with your ability to stay hydrated. Stay nourished. As much as we love Tim Horton's, we also recognize that the coffee-dependent culture that we operate in makes it easy for us to forgo the long, stable flow energy we get from proper nutrition in favour of a caffeine jolt. That might do for a quick ten minute zip to your workplace, but for a longer trip, you'll crash on that alone. (Moreover, caffeine is a diuretic which will work against your goal of staying hydrated). Pack snacks that are high both in nutrients, and in fibre. Cut fruit, and bran muffins are great options. These will release sugars into your bloodstream more slowly, giving you a stable store of energy, which in turn will prevent you from crashing. Bring lemon water. While gingerale is the beverage that comes to mind for most when thinking of ways to soothe an upset stomach, a cleaner, sugar-free alternative is lemon water. Drinking freshly squeezed lemon juice mixed with water can go a long way to settle you. Try to include protein in your snacks and meals throughout the day, as this can combat nausea well. Have a store of crackers or rice cakes, as these can often fight nausea quickly. Have a backup driver in the vehicle with you if you know you are prone to motion sickness, and know when to hand over the keys. Being prepared is too hard so I shouldn't bother trying. It can be very easy to adopt an attitude of passive perfectionism when it comes to preparedness, with a mindset that determines a thing should either be done well, or not done at all. That simply isn't the case with preparing for a disaster. To begin with, it isn't nearly as intimidating as you might think because others have done it before you, and are willing to share their advice. Websites like Canadian Red Cross http://www.redcross.ca/article.asp?id=33841&tid=001 and Health Canada http://www.hc-sc.gc.ca/hl-vs/iyh-vsv/life-vie/emerg-urg-eng.php offer good starting points. Furthermore, it's better that you do a partial job than none at all: one household may have enough to eat for three days, while the other has none. In a crisis that leaves them stuck at home for five days, is either perfectly prepared? No...but who would rather be? There's always 911. While it's true that emergency response crews will do all they can in a situation of crisis to assist those that depend upon them, when disaster strikes, their ability to respond will be restricted: for one thing, you can expect that you won't be the only person relying upon them, so there will most definitely be delays in their response to you; for another, depending on the nature of the disaster, they may be physically deterred or altogether prevented from access to you if major roadways have been damaged or blocked off. This is not to say that you should not call 911 if you have suffered serious injuries in a widespread disaster, but in forming a plan, this should definitely not be your only course of action. I can just print off a checklist of what I need to have and that will be enough. Checklists are definitely a wonderful starting point for disaster preparedness, but don't assume that this will suffice. You and your family are going to have slightly varying needs from those of others. For example, if there are certain medications that must be taken daily, make sure to have a small backup supply in case you run out of a current round in the middle of disaster. Monitor your family's needs over a week or so, and make notes about what is indispensable for you. Use those notes to augment your list, and subsequently, your kit. Insurance will cover everything. While insurance exists to protect you, this entails doing your part to make sure you are covered for the sort of disasters that you could be exposed to. Many people haphazardly purchase a plan they haven't given much thought to, and then have unrealistic expectations about the amount of coverage it provides. They imagine that in the aftermath of a disaster, their life will be perfectly rebuilt top from bottom in a matter of days to its exact state pre-disaster. Unfortunately, the reality is a far cry from that. Insurance policies vary greatly in what they do and do not cover, so it behooves you to do your research. Even if you end up not opting for certain types of disaster-related insurance, you should make sure you know beforehand what you're covered for. This way, when you are met with disaster that you are not covered for, your world won't fall apart a second time when you receive the nasty surprise of learning this. When establishing a weekly, monthly, or even annual household budget, there are costs that we deem to be fixed, and costs that vary from month to month. Most people tend to think of utilities as a roughly fixed cost: even if the figure you pay isn't identical from month to month, it's very close. But it's possible for this figure to vary greatly...especially if you have discovered ways to cut down on the amount of money you spend in this area. Be sure to have adequate insurance coverage. Making sure that your property, as well as the appliances therein, are covered comprehensively by your insurance plan can help you save money in the long run. The reason? If you find a portion of your home's structure, or an electrical-dependent (or water-dependent) appliance that is impaired in its functioning, it is more than likely to be using far more resources than if it were running properly. Having adequate insurance coverage enables you to have such problematic fixtures repaired or replaced right away in order to avoid the wasted costs of operating these fixtures with a defect. Use aerators. Aerator screens are wonderful little devices that attach to faucets. They work by incorporating air into the water stream to increase the perceived pressure of the water as it hits you. This is advantageous because instead of relying on the water-wasting method of increasing the water-flow (and thereby, water consumption) of your faucet in order to increase pressure, the same effect is achieved without drawing upon additional resources. Your house may already have them on one or two of your faucets, but it is unlikely that all of your water fixtures have them. If attaching aerators on all of your faucets seems to daunting a task, identify the faucets in your home where you tend to require strong water pressure, and start with those. Place a container of water in your toilet tank. Every time you flush the toilet, the tank refills by drawing up a set amount of water (ie enough water to fill the tank). If you see to it that a portion of the tank is always full, then this is a portion that will not require replacement every time you flush. What you are effectively doing is decreasing the volume of your tank. Caution should be taken with this method though, to ensure that you still have enough water cycling through your tank to effectively flush. Otherwise, you run the risk of a clogged toilet. Also, flushing your “efficient” tank twice wastes more water than flushing your standard toilet, so you want to make sure that you avoid the issue of too little water. Use caulking in the winter. Using a caulking gun, seal the edges of your windows. The amount of air, and thus heating, that escapes through these tiny openings will shock you. Caulking is easy to apply, takes very little time to set, and is easy to remove once the season is over. All you have to do is loosen an end and give it a tug. If there are windows in your house that you open frequently throughout winter, caulking may be a nuisance to keep removing and reapplying for those. However, if there are windows in your home that are relatively unused, applying caulking to those will save you tremendous amounts in energy spending. Grow things. At this time of year, it's hard to thinking ahead to those hot summer months when we'll be seeking refuge from relentless heat, but those days come every year, so there's good reason to believe they're on their way again this year. “Greening” your property can actually lower the amounts you spend on air conditioning significantly. One way of doing this is to grow grass, or another appropriate plant, on your roof. This can lower your home's temperature by a full two degrees. Additionally, planting trees in a way that blocks excess sunlight out of targeted rooms can achieve similar results. Do you have a favourite tip for saving money on your utility bills? We'd love to hear it! Make sure sleepwear fits snugly: Many a seasoned parent will tell you that one way to exercise frugality in baby expenses is to buy clothing that is slightly on the large side. This makes good sense, as your child will be less likely to outgrow it so quickly. This is fine advice to follow for daywear. However, sleepwear needs to be snug fitting. One good reason for this is in order to prevent suffocation. Your sleeping infant should have no loose objects, garments, or textiles with them in their bassinet or crib: they should be placed in their area of sleep simply with the garments they wear and nothing else. Consider using wearable blankets: Since you cannot keep your baby warm by draping a blanket over the child the way you sleep with a blanket over yourself, seek alternatives that keep your baby warm without the risks of suffocation: wearable blankets are an excellent solution for this problem. Avoid over-dressing your baby: The temptation with new parents is to err on the side of over-bundling their children. It's an easy enough mistake to make: babies look so tiny and helpless, and in need of all the protection they can get from the outside elements. However, over-dressing your baby poses a risk of overheating, which could lead to sudden infant death syndrome (SIDS). The rule of thumb for deciding just how many layers (and of what material and thickness) you should be dressing your baby in is this: look at your own clothing which you have deemed to be comfortable and appropriate for the day's climate, dress the infant similarly, and add one more layer to that for the baby. Steer clear of embellishments: Clothing with buttons and loose ornamentation like sequins or bows should be avoided. Your child will surprise you with how soon he or she begins to explore and play with their surroundings, and you don't want to discover this through the nasty surprise of discovering them choking on an object they loosened from their garments. This does not mean you must forgo clothing with any semblance of aesthetic appeal, however. For example, clothing that has embroidered or printed designs on it is both safe and attractive. When possible, opt for fire-retardant clothing: This is more important with sleepwear, since you may be asleep when your child is, and may not be alerted to the dangers of a fire until it is well under way. This is actually much easier than it sounds, and does not involve seeking out highly specialized products from very limited sources. In fact, much of baby sleepwear is flame retardant; to learn if this is the case for a specific item, simply check the label. It will say that it is if this is the case. Icy walkways: Icy walkways are one of the most common type of hazard that business have to deal with, and one of the worst liabilities. Depending on the size of your company, you will either want to take care of this internally, or hire an outside company to take care of this for you. Remember that diligence is key with snow and ice removal, and know yourself: if you know you won't be able to maintain your walkways at all times, you should definitely turn to a professional—even if you decide to have hired help only half of the time, and to take responsibility for cleaning yourself the rest of the time. Obviously the most critical time during which the area needs to be well cleared is during your business hours, when you are more likely to have people walking about your premises. Wet floors: Certainly, regular cleaning and disinfecting routines are part of maintaining a healthy business environment, but they also pose the risk of wet floors. Know when your floors will be washed, and be sure to use caution signs. If at all possible, block off the affected areas until they are dry. Of course, wet floors may also ensue when a constant stream of foot traffic in the winter treks in snow from outside which then melts in the warm indoors. Try to anticipate that ahead of time, and minimize the moisture by placing generously sized absorbent mats at the entrance of your business. Janitorial closets: A closet packed with cleaning supplies is full of chemicals that might be great for destroying microbes, but terrible for direct contact with people. This can be dangerous for children who wander out of their parents' supervision, but it can also be dangerous for adults who mistake a hazardous substance for a safe one. Eliminate that risk by keeping all such solutions in a locked space, limiting the number of people who have access to this space. Unstable furniture and fixtures: If you have been affected by an earthquake of considerable force at any point in your life, you know the importance of making sure that furniture is secured and stabilized. Bolt bookcases to the wall, as well as flat screen displays, and try to minimize the amount of trinkets and loose objects lying around, waiting for their turn to bump someone in the head. Unkempt lawns: A yard that has not been maintained isn't just an eyesore, it's dangerous. Piles of leaves can disguise uneven ground, which can lead to injury. Vines and sticks can be tripping hazards, as can gnarly roots in overgrown trees. Trees also need trimming to eliminate the risks of heavy limbs falling and causing damage to a visitor's property, or injury to their person (particularly during stormy weather). As with snow and ice removal, determine what you are able to do in this regard yourself, and hire out the rest to a professional. Invest in contents insurance – Not all of your possessions are automatically covered under your homeowner's insurance policy. It is key for you to determine which of your belongings are and are not covered by basic home insurance. This will both prevent you from overspending on coverage (ie buying contents insurance for items that don't require it), and will alert you to vulnerable items that are not covered. Even if you are not prepared to make an investment in contents insurance right away, you should meet with your insurance provider in order to determine what's covered and what's not. This way, if and when theft or damage does occur, you don't receive insult upon injury when you try to claim an uncovered cost. Keep an inventory – There are several means for keeping an inventory. Be sure to familiarize yourself with your own organizational strategies and pick the method that you are most likely to keep track of and update regularly. For example, you may keep hard copy record of your items. Alternatively, you may store such data electronically on your computer. You may even choose to use a web-based application for cataloging this information. However you choose to do it, be sure you have backups; multiple means of storing the information (ie electronic and hard copies), as well as multiple locations (ie a copy with you in your own home, and a copy with a friend or relative who does not live with you) will minimize the chances of losing that data. Use multimedia – The more detailed your catalog of items, the more likely you are to make a quick and complete recovery of the value of whatever has been lost or stolen. Recording details about these items in writing is one way to do this. However, an even easier method for achieving the same results is to use a camera. You can either take photographs that you later accompany with notes, or you can use a video camera—this has the added advantage of allowing you to speak your “notes” while the object is being filmed, making for a speedy entry. It also poses the advantage of making an easier job of taking a full three dimensional scan of the item, which will ensure that its visual details are preserved. File your receipts – One of the easiest record to keep of the value of an item is in the receipt that outlines its original purchase. Receipts are good records because they are hard to dispute: you are not guessing at the items value, rather, it has already been determined by an outside source. For items that improve in value with age, make sure to have current appraisals from certified appraisers. Insurance brokers will base their claim payouts on certified appraisals that you provide. If they are out of date, it may be difficult to adjust for the increased value. To find an appraiser near you, visit http://www.cpa-cappa.com/ to help you locate one anywhere in Canada. When we consider child safety around the home, the first hazards that come to mind are those involving sharp objects, hot objects, and power. However, there are several seemingly benign items around the home that can make hazards of themselves. Dishwashers – It is true that no matter how many high quality toys you purchase for your child, they will inevitably find more interesting things to explore in your household. One such popular “toy,” as unlikely as it may seem to an adult, is the dishwasher. With buttons, sounds, sliding racks, pegs, it's the works! Unfortunately, that also makes it just as much dangerous as it is amusing. Tiny hands can get pinched in the locking latch, fingers can be crushed under the rolling racks, and sharp utensils can cause injury. The easiest way to deal with the safety risk of a dishwasher is to make sure sharp utensils are pointed downward when you put them into the utensil carriage, and that you keep the dishwasher locked when you aren't loading or unloading it. Bed – We've come to associate the bed as a place of comfort, rest, and safety, so it may seem odd to see it listed as a potential safety hazard. However, with very small children, certain toys and linens that you might think would be safe in the bed are actually hazards for choking and suffocation. Newborns especially should not have any soft toys or linens of any kind with them in their crib. (If you are concerned about warmth, you can use a wearable blanket). Additionally, the hardware of a bed itself should be carefully checked from time to time to ensure that it's ability to stand and support your child hasn't become compromised, as some cheaper furniture can often do. Purses and work bags – It's amusing to adults when children try to imitate their elders, or when they make snoops of themselves in what adults would consider private territory. However, an unsupervised child playing with a purse is exposed to several hazards. Bag straps can become wrapped around the child's neck and cause strangulation. Zippers can injure hands. Additionally, small items that are tossed loosely into your bag, such as change or lipstick, can be choking hazards. When you are not using your purse or bag, store it in a place that is out of reach. Televisions – Most of us don't look at our television sets as particularly dangerous pieces of household equipment—they don't have blades or sharp edges on them that alarm us. The danger in a television, however, is in the weight of the object itself. A flat screen television may not actually be that hard for a child to pull down. The weight of such a fall could hurt the child substantially. To prevent this, keep your television atop a sturdy, low level stand, and either strap it down using earthquake straps, or mount it into the wall. Standing water - Children have a fascination with water—particularly when they are beginning to explore various textures and materials (that's why there can be much competition for space at the water table in kindergarten!) It's important for you to be aware of this curiosity, and to realize that it doesn't take much standing water for a child to drown in it. Be sure to drain all sources of standing water in your house. If this is not possible, then take measures to secure the area where the standing water is so that it cannot be accessed by a child.